Teams playing others with their coach either getting fired or leaving for another opportunity were vastly superior bets vs. the spread this year. If you picked solely against absent coaches, you would have gone 6-of-7, and would have lost the 7th game by 0.5 points. One other strategy played out the opposite of what I expected: Little Sisters of the Poor went 2-0 against big conferences. The rest of the strategies were break-even at best. 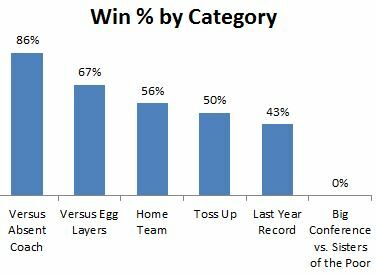 Betting on the home team yielded a 56% win %, and toss ups were indeed toss-ups (50%). Teams playing ones I considered “Egg Layers” went 2-1, but the small sample size was not convincing. So next year, when you’re formulating your Bowl pool, pick against the teams that lost their coach, and steer clear of the rest.